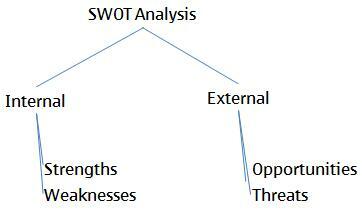 SWOT analysis is a technique which can be used to aid strategic planning. Strategic Planning can be thought of as the process an organisation uses to define it’s strategy, that is, it’s future course. SWOT Analysis is a technique we can use to understand the Strengths, Weakness, Opportunities, and Threats being faced in order to achieve a particular objective. SWOT analysis can be used in a number of contexts, covering both organizations and our personal lives. SWOT works by examining internal factors (Strengths and Weaknesses) and external factors (Opportunities and Threats) impacting on the objective. What gives SWOT analysis its power is that it enables us to very quickly find opportunities that we are actually well positioned to exploit. Additionally, by understanding your weak areas and external threats, you can take steps to manage those that might not have otherwise been obvious. In a business context, SWOT helps you to construct a strategy which aligns opportunities and your strengths, so you can effectively differentiate yourself from your competitors, while at the same time mitigating potential threats facing this strategy. The aim obviously being to help your business be successful in the future. SWOT analysis doesn’t just have to be used to determine the direction of the whole organisation, it could also be used at a product level, a marketing plan level, or even a project level. You can even use SWOT analysis to examine your competitors and their products. As mentioned previously, SWOT doesn’t just have to be confined to the business arena. We could use SWOT analysis on ourselves personally, for example, to examine our career, thus helping us to create a compelling career based on our capabilities and personal tastes matched to the opportunities in the marketplace, all the while keeping a keen eye on the threats facing us or weaknesses we might have. Let’s examine what we mean by Strengths, Weaknesses, Opportunities, and Threats in turn, before moving on to work through an example, with the aim of giving you a thorough understanding of SWOT analysis. Do you have patents in place? Do you have any cost advantages (access to cheaper resources)? Do you have special know-how amongst your staff? Do you make use of exclusive distribution rights? Do you have any logistical advantages? What might your competitors say are your strengths? Are you missing patent protection in certain areas? Are your resources too expensive, or your cost structure too expensive? Are your distribution channels weak? Are your distribution rights non-exclusive or shared? If customers have left you, why was this? If you are consistently failing to make sales, why is this? What might your competitors see as your weakness? What are the major trends in the marketplace? What are the trends in government policy/law? How are people’s social behaviours changing? What is likely to be your competitors focus in the coming years? Have you noticed changes in what your customers are buying? How are peoples lifestyles, working environments changing? Could customer needs or trends shift your customers away from you or your product? Are there potentially new laws or regulations which could impact you? Is the industry or your consumer moving the same direction? Could new technology render your business/project/skills/product obsolete? Can you determine your competitor’s strategy and how much should you be worried about this? What barriers are in your way preventing you from getting to where you want to be, and can these be overcome? To help you gather your SWOT data you may want to consider using Brainstorming or the Delphi Technique (these are described in the article on Identifying Risks). Once you have a list of bullet points under each item of the SWOT, prioritise them so the most important is at the top and the least important at the bottom. This is useful in helping you to concentrate your thinking on the most important factors. Don’t just rely on SWOT analysis to feed into your strategic planning. Use additional tools such as PEST analysis, EPISTEL, or STEER analysis. One area where a SWOT analysis can be powerful, is that it can help an organization understand that it should’t necessarily chase the most lucrative idea. Instead there might be better ways to create competitive advantage within the marketplace, that is, where aproaching opportunities seem to fit with your strengths, and the opposition are moving in a different direction so that the visible threats are minimal. Largest online seller of books in core territory. Low overheads as no stores required. Therefore we are the cheapest in our core territory. Access to a much wider range of books than a physical store. Poor customer support (email only customer support provided). We do not have exclusive distribution rights to any of the books we sell. We have a broad focus whereas our competitors are focussed on individual niches. City centre distribution centre has limited expansion capacity. Focus on providing customers with a great price and great customer service: introduce telephone based customer service. Offset the cost of this by moving the distribution centre out of the city centre so it operates on a lower cost base. Focus on eBooks: we already have a great online retail platform. Aim to achieve time limited exclusive distribution rights (can we sell an eBook exclusively 1-week before anyone else if we can promise certain volumes?). 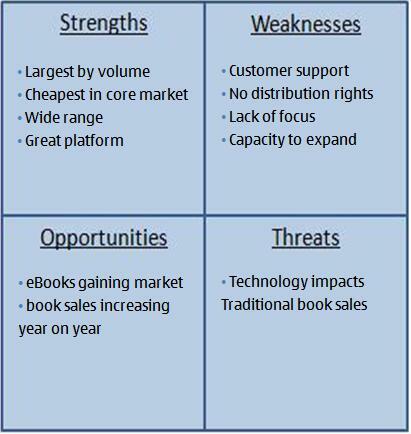 Can you think of any other strategies the bookstore may want to consider based on the SWOT matrix? In summary, SWOT analysis facilitates the creation of a strategy by examining strengths, weaknesses, opportunities, and threats. It can be used in a personal or business context. 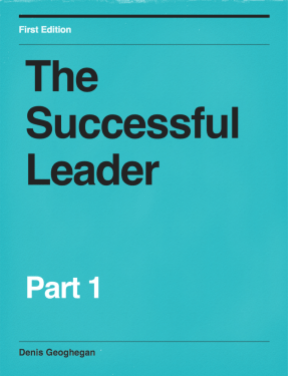 It’s power comes from it’s ability to help us carve out competitive advantage. They are also relatively simple to perform. If you’re running a project or a program, why not see if there are any obvious improvements which can be made to it by working with your team to perform a SWOT analysis.